MY PRIVATE CAR : This " Auburn on steroids " started it's life as a 1950 Seagrave Firetruck which served in Miami Beach. More recently , it was " saved " from a local wreckyard by Wil Anders , who took out the burnt up engine , took it down to the frame , mounted the cowl further back etc. and slapped in a reliable 454 CU. GM V8 , coupled to a aut. trans. Having finished the mechanical part and the nose end , he eventually ran out of steam and money , and that's when I saw it at first , and immediately saw it's potential for the ultimate fun car. I must have stood for 2 hours with one eye closed , my hand in front of the rear end , and the other hand chopping down the windshield , and imagining a boattail rearend a la the 30's cars I love. Well , I was able to talk Will out of the car , and it sat for a year or so until I finally got to it. 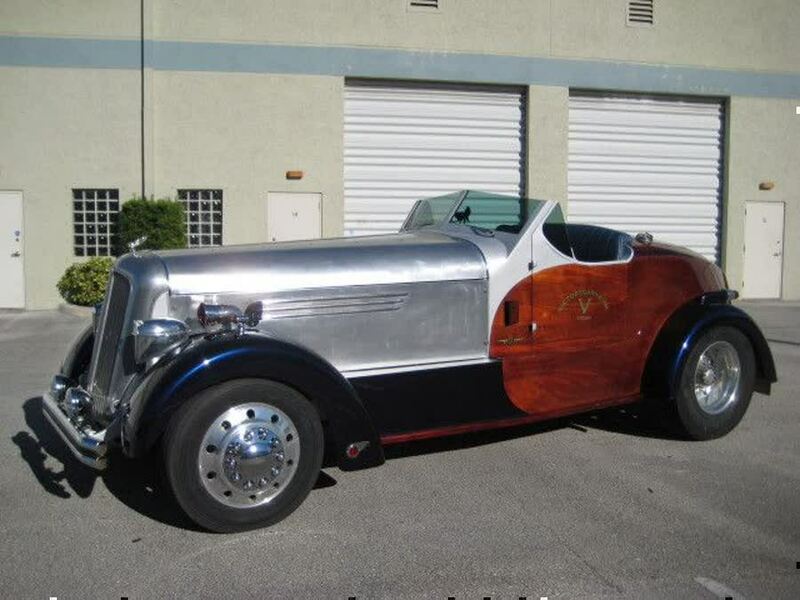 I knew a couple of fella's here in town , who had once helped me build a beautiful mahogany wood tail to my Duesenberg , and they were the perfect guys for the job I invisioned. It's been a work in progress for a few years now , and with the help of Bill Coffman and Bill Penzella of CF BOATS here in Ft.Lauderdale among others , we've been getting closer to our goal. It's been great re-designing this car " on the go " , something I like doing best. Hunting for special parts like fender lights and such at flee markets like Hershey and on eBay has been real rewarding and great mind yoga ! Still lots of things to do ,like fabricating a top ,steps to get in it etc. Ultimately , I'm thinking about installing TWO 454 cu. Supercharged V8'S under the hood, and the dash gauges and starter buttons are already set up for that. The push button trans works great , and it's a blast to drive around town ! ( including using the blast of my REAL trainhorn , haha )Now , I have owned plenty cool cars , but I've NEVER owned anything like this that gets people running out of their cars to take pictures and asking questions ; it's a great feeling knowing our creativity is paying off , and we're causing lots of smiles and looks of disbelief ! It's a great stress reliever after a week of hard work , and I always come home with a big grin on my face ! Is it for sale ? Hmmm.. really don't know , don't care..maybe , if you pay me enough..What's enough ? Well ,it would have to be $675,000. So , there you have it..I said it anyway ! And by the way , if people pay $95 k and more for a microcar , it REALLY makes my car a bargain at only $675 k ! SOLD.. 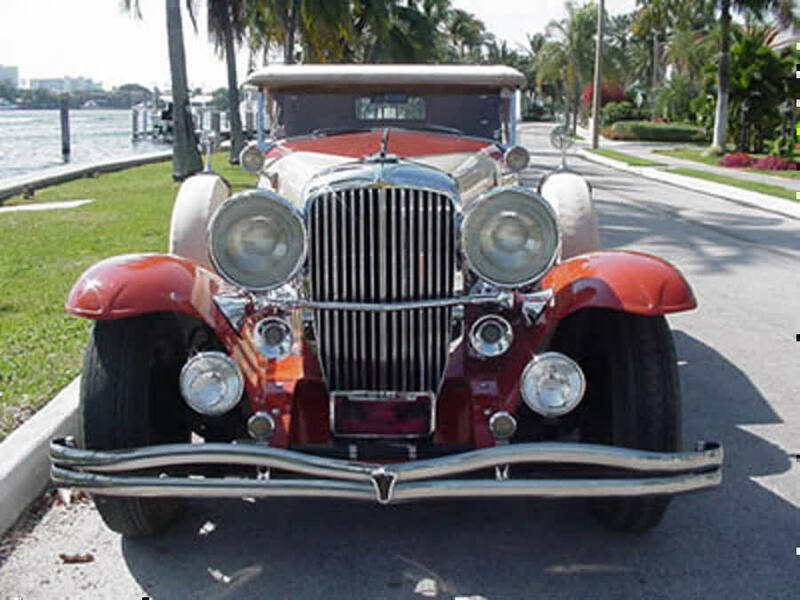 This beautiful 1932 / 1983 Duesenberg II is one of just a handful factory produced cars that were expertly crafted by Elite Heritage / Duesenberg Motors in Elroy , WI. Newprice 30 years ago approached $200 k then and they sold out instantly , a true testament to the quality of the build. All hardware like the grille and windshields etc is cast in Bronze and then chromed. Drivetrain is a 460 cu V8 bigblock Ford coupled to a auto trans and the car has powersteering and brakes with discbrakes in the front. Heat and AC were standard. She sits on correct 19" true wirewheels complimented by widewall tires. 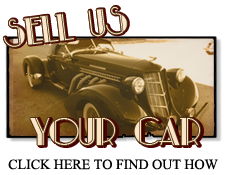 This particular car is loaded with options like sidecurtains ,grilleguard , floor shift control , custom burlwood dash that hides the modern controls , new leather interior , fresh cloth softtop and even the expensive pilot ray foglights that actually turn with the direction of the wheels ! With the market moving up and up and the original models bringing several million dollars now , the price I'm asking is just about 10 % of the price you'll have to pay for an original , whereas this Duesenberg II will be much easier to drive and maintain without having to have any second thoughts about merging into modern day traffic. I sold this beauty about 7 years ago to a friend in Europe , where it was imported into the UK. Just traded her back and imported her , and she's still a looker ! SOLD !!! THANK YOU Mr. G ! !